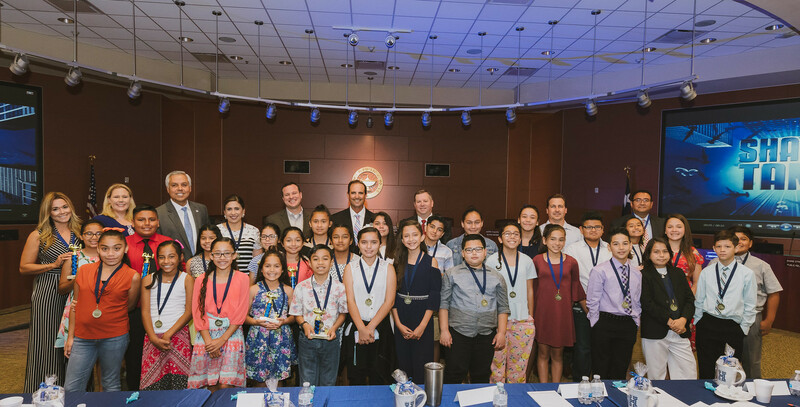 Elementary teams from across Harlingen CISD came together for the second annual Little Innovators competition. Fifth-grade inventors pitched their ideas to local business professionals during the Shark Tank-themed event. Presentations varied from the Open O-Easy, an apparatus allows for resealable snack bags to the Puppy Trainer, which simplifies disposable potty-training pads for dogs. Students designed and developed their ideas and presentations over a two-week period under the guidance of their teachers. Taking first place were Amber Loya and Eloy Trevino from Milam Elementary with their Shower Drops creation – pods filled with shampoo, conditioner, or body wash. The team geared their product toward travelers methodically researching TSA’s 3-1-1 security rule for flying with carry-on liquids (3.4 oz bottle or less; 1 quart-sized, clear, plastic, zip-top bag; 1 bag per passenger). In addition to winning first place, the team was awarded a $1,000 scholarship to be divided among the two students when they attend college. Presenting the award was Richard Galvan, CEO at G5 Internet Services. Coming in second were Kayla Villalobos, Alyssa Gonzales, and Hayden Davis from Austin Elementary. Lamar Elementary took third; team members include Ariana Vasquez, Joseph Crouch, and Angela Barrera. Taking fourth place were Alexa Pacheco, Clara Gracia, and Karla Rivera from Stuart Place Elementary. Judges for the contest included Eric Kennedy Owner of SpawGlass Construction, Francisco Castellanos Owner of Chick-Fil-A in Harlingen, Michael Lamon- Chief Operations Officer of Texas Regional Bank, Richard Galvan Owner of G5 Internet, Kyle Orgera Vice President of First Community Bank, Maru De La Paz Marketing Liaison for Neighbors Health, and Monica Benavides Owner of Monica Benavides Team/Keller Williams.